Russian short range ballistic missile. Stalin did not decide to proceed with Soviet production of this copy of the German V-2 until 1948. Despite the threatening supervision of the program by Stalin's secret police chief, Beria, and the assistance of German rocket engineers, it took eight years for the German technology to be absorbed and the missile to be put into service. It was almost immediately superseded by later designs, but the effort laid the groundwork for the Soviet rocket industry. Surplus R-1's were converted to use as a sounding rockets for military and scientific research missions. AKA: 8A11;8K11;Scunner;SS-1A. Status: Retired 1964. First Launch: 1948-09-17. Last Launch: 1959-11-09. Number: 88 . Payload: 547 kg (1,205 lb). Thrust: 271.50 kN (61,036 lbf). Gross mass: 13,248 kg (29,206 lb). Height: 14.02 m (45.99 ft). Diameter: 1.65 m (5.42 ft). Span: 3.66 m (12.00 ft). Apogee: 330 km (200 mi). The decision to copy the German V-2 missile did not come quickly. Following construction of an initial batch of V-2 missiles in Germany (the N series), and the removal of available German rocket specialists to Soviet territory, Stalin spent some time before deciding what to do with them. It was not until 26 July 1947 that a decree was issued for test of the V-2 missiles at the new rocket test ground at Kapustin Yar. The test series consisted of a mix of rockets assembled in Germany at Nordhausen (series N) and those assembled in the Soviet Union at NII-88 in Kaliningrad (series T). Officially a test series of 11 series T and N rockets were fired from October to November 1947. An alternate account states that 11 'N' series rockets were launched from September to October 1947, followed by 10 T series sometime later. German assistance was required to get the rockets to fire. Of the 11 launched, only 5 worked. The results of the alleged follow-on launch of 10 'T' series rockets was said to be just as dismal. A resolution to put into production a Soviet-built copy of the V-2, the R-1, was issued on 14 April 1948. Aleksander Shcherbakov was responsible for seeing that a fifteen year technology gap was bridged. To accomplish this the resources of 13 research institutes and 35 factories were tapped. Glushko was tasked with producing the RD-100 copy of the V-2 engine. Prototypes had already begun factory tests at the end of 1947, with stand tests beginning in May 1948. R-1 test flight trials were accomplished swiftly - ten in 1948 and 20 in 1949. On 25 November 1950 the missile was accepted for service, with the first operational unit being the 92nd brigade (BON RVGK) at Kapustin Yar. Things seemed to be going well, but getting the missile in production would be another matter. The missiles flown so far had been built by Korolev's NII-88 research institute at Podpliki. But Soviet aerospace practice was to assign production to a factory facility. Factory 66 at Zlatoust was selected for this in 1949, with SKB-385 to assume production design responsibility and to develop variations of the R-1 with greater range. But the work dragged on without results, and on 1 June 1951 Beria switched R-1 production to Factory 586 at Dnepropetrovsk. He ordered engine production to begin in two months - even allowing an engineer to blurt out that it would take at least eight months without consigning him to the Gulag. But the engineer was more nearly right, and the first Dnepropetrovsk production R-1, albeit still containing many parts and assemblies fabricated at NII-88, was finally completed in June 1952. First stand tests of production 8D51 engines began on 15 August 1952. The first rocket built completely of Dnepropetrovsk-fabricated parts was rolled out on 28 November 1952. Nevertheless in December 1950 the first field R-1 unit was formed - the 23rd brigade (BON RVGK). Each brigade was equipped with six launchers. In January 1951 the 23rd deployed to Kamishin in Volgograd oblast. Further deployments of this pathfinder unit were to Belokovorovich, Ukraine; Shyalyay, Lithuania; Dzhambul, Kazakhstan, and Ordzhonikidze, the Far East, the Primorsk area. The 77th and 90th brigades were formed at Lvov, Khmelnitskiy, and Zhitomir, Ukraine. In August 1958 they were transferred to the Land Forces. The number of units fielded was small, reflecting the long delay in getting the R-1 into production. The difficulties confirmed the German's 1946 assessment that Russian industrial technology was fifteen years behind that of Germany. The field equipment was designed to also be used for R-2 missiles, which quickly replaced the R-1 in the field units. A sea launched variant of the R-1, probably similar to the German 'Pruefstand VII' submarine-towed, pod-launched project, was also studied from 1949 to 1950, but not proceeded with. R-1A for test of separable warheads for use on future ballistic missiles (the R-2 and R-3). The last two launches were vertical scientific flights to sample the upper atmosphere. 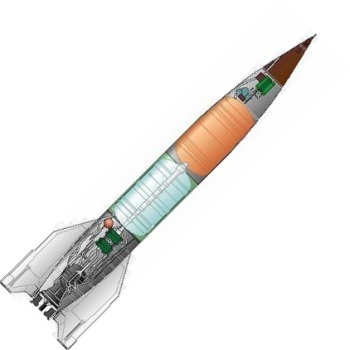 R-1B and R-1V for study of cosmic rays, the upper atmosphere, solar radiation, recoverable biological payloads, and recovery of the entire missile by parachute for reuse. R-1D for study of the atmosphere; aerodynamics of test shapes at high velocities and altitudes; wind in the upper layers of the atmosphere; the ionosphere; and recoverable biological and instrument payloads. R-1Ye for study of the atmosphere, solar spectrum, aerodynamics; wind in the upper layers of atmosphere; ionosphere; ozone layer; recoverable biological specimens, and recovery of the entire missile by parachute. Official figures for the missile version include: Payload 815 kg. Range 270 km. Maximum altitude 77 km. Time of flight 5 minutes. Max velocity at burnout 1465 m/s. Accuracy 8 km in range, 4 km laterally. Maximum range: 260 km (160 mi). Number Standard Warheads: 1. CEP: 6.94 km (4.31 mi). Boost Propulsion: Storable liquid rocket, Lox/.70 Alcohol. Maximum speed: 5,280 kph (3,280 mph). Initial Operational Capability: 1947. Stage 1. 1 x R-1. Gross Mass: 12,630 kg (27,840 lb). Empty Mass: 4,066 kg (8,963 lb). Thrust (vac): 307.085 kN (69,035 lbf). Isp: 233 sec. Burn time: 63 sec. Isp(sl): 206 sec. Diameter: 1.65 m (5.42 ft). Span: 3.54 m (11.61 ft). Length: 14.15 m (46.42 ft). Propellants: Lox/Alcohol. No Engines: 1. Engine: RD-100. Other designations: 8A11. Status: Out of Production. Comments: Payload 815 / 483 kg. Range 270 km. Maximum altitude 77 km. Time of flight 5 minutes. Max velocity at burnout 1465 m/s. Accuracy 8 km in range, 4 km laterally. Family: short range ballistic. Country: Russia. Engines: RD-100. 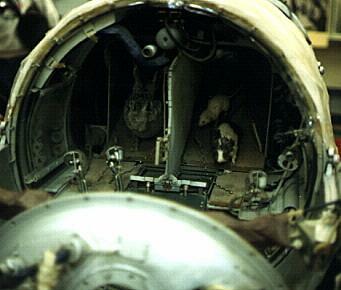 Launch Sites: Kapustin Yar, Kapustin Yar V-2. Stages: R-1 stage. Agency: Korolev bureau. Bibliography: 2, 283, 344, 474, 476, 86, 89. 1946 June - . LV Family: V-2. Launch Vehicle: R-1. Groettrup team completes R-2 design. - . Nation: Russia. Related Persons: Groettrup. Groettrup team in Nordhausen completes design of the K1 (R-1). The design uses some parts manufactured in reopened factories in the German east zone. Factory 88 at Podlipki (later Kaliningrad, then Korolev) 16 km north-west of Moscow, and Factory 456, at Khimki, 7 km north-west of Moscow, are to be the first two Soviet rocket assembly factories. 1946 June 21 - . LV Family: V-2. Launch Vehicle: R-1. NII-4 founded. - . Nation: Russia. Decree 'On establishment of NII-4' was issued..
1946 July 3 - . LV Family: V-2. Launch Vehicle: R-1. Plant 456 at Khimki (later OKB-456, NPO Energomash) formed. - . Nation: Russia. Ministry of Aviation Industry (MAP) Decree 424 'On redirecting Plant No. 456 at Khimki for the production of rocket engines' was issued..
1946 July 14 - . LV Family: V-2. Launch Vehicle: R-1. First rocket unit of Soviet military formed. - . Nation: Russia. Decree 'On establishment of BON of Fourth Directorate of GAU in Ministry of Armed Forces' was issued..
1946 August 9 - . LV Family: V-2. Launch Vehicle: R-1. Korolev named Chief Designer for R-1 rocket (copy of German V-2). - . Nation: Russia. Related Persons: Korolev. Ministry of Armaments Decree 83-K 'On appointment of S. P Korolev as Chief Designer of R-1' was issued..
1946 August 26 - . LV Family: V-2. Launch Vehicle: R-1. NII-88 reorganised. - . Nation: Russia. Decree 'On establishment of structure of NII-88' was issued..
1946 August 30 - . LV Family: V-2. Launch Vehicle: R-1. Korolev head of Department 3, NII-88. - . Nation: Russia. Related Persons: Korolev. Decree 'On appointment of S. P. Korolev as Chief of Department No. 3 of NII-88 SKB' was issued..
1946 September 29 - . LV Family: V-2. Launch Vehicle: R-1. OKB-456 formed (later Energomash). - . Nation: Russia. Council of Soviet Ministers (SM) Decree 1167 'On establishment of OKB-456 at Plant No. 456 at Khimki' was issued..
1946 October 23 - . LV Family: V-2. Launch Vehicle: R-1. Groettrup team transported to Soviet Union. - . Nation: Russia. In overnight roundup, 20,000 Germans transported to USSR to transfer technology on aerospace and other technical fields..
1948 April 14 - . LV Family: V-2. Launch Vehicle: R-1. Decree for production of R-1 and R-2 missiles, design of R-3. - . Nation: Russia. Related Persons: Glushko. Decree 'On work on the R-1 and R-2 missiles' was issued. To accomplish putting the R-1 into production the resources of 13 research institutes and 35 factories were tapped. Glushko was tasked with producing the RD-100 copy of the V-2 engine. R-1 stand tests began the same day the decree was issued (Prototypes had already begun factory tests at the end of 1947). The decree also set forth design goals for the R-3.The specification was an order of magnitude leap from the other vehicles - to deliver a 3 tonne atomic bomb to any point in Europe from Soviet territory - a required range of 3000 km. 1948 September 17 - . Launch Site: Kapustin Yar. Launch Complex: Kapustin Yar V-2. LV Family: V-2. Launch Vehicle: R-1. FAILURE: Veered 51 degrees from flight path..
Nation: Russia. Agency: Korolev bureau. Apogee: 0 km (0 mi). First of 9 rockets of first test series. Veered 51 degrees from flight path..
1948 October 10 - . Launch Site: Kapustin Yar. Launch Complex: Kapustin Yar V-2. LV Family: V-2. Launch Vehicle: R-1. Nation: Russia. Agency: Korolev bureau. Apogee: 100 km (60 mi). Range achieved 300 km. Successful flight..
1948 October 11 - . LV Family: V-2. Launch Vehicle: R-1. R-1 flight. - . Nation: Russia. First R-1 flight with scientific experiments..
1948 October 13 - . Launch Site: Kapustin Yar. Launch Complex: Kapustin Yar V-2. LV Family: V-2. Launch Vehicle: R-1. Test mission - . Nation: Russia. Agency: Korolev bureau. Apogee: 100 km (60 mi). 1948 October 21 - . Launch Site: Kapustin Yar. Launch Complex: Kapustin Yar V-2. LV Family: V-2. Launch Vehicle: R-1. 1948 October 23 - . Launch Site: Kapustin Yar. Launch Complex: Kapustin Yar V-2. LV Family: V-2. Launch Vehicle: R-1. 1948 November 1 - . Launch Site: Kapustin Yar. Launch Complex: Kapustin Yar V-2. LV Family: V-2. Launch Vehicle: R-1. 1948 November 3 - . Launch Site: Kapustin Yar. Launch Complex: Kapustin Yar V-2. LV Family: V-2. Launch Vehicle: R-1. 1948 November 4 - . Launch Site: Kapustin Yar. Launch Complex: Kapustin Yar V-2. LV Family: V-2. Launch Vehicle: R-1. 1948 November 5 - . Launch Site: Kapustin Yar. Launch Complex: Kapustin Yar V-2. LV Family: V-2. Launch Vehicle: R-1. Nation: Russia. Agency: Korolev bureau. Apogee: 100 km (60 mi). Ninth and last launch of first R-1 test series..
1949 September 10 - . Launch Site: Kapustin Yar. Launch Complex: Kapustin Yar V-2. LV Family: V-2. Launch Vehicle: R-1. Nation: Russia. Agency: Korolev bureau. Apogee: 100 km (60 mi). First launch of second series - 10 preproduction and 11 prototype rockets available. A total of 20 were fired; six failures in 16 launches..
1949 September 11 - . Launch Site: Kapustin Yar. Launch Complex: Kapustin Yar V-2. LV Family: V-2. Launch Vehicle: R-1. 1949 September 13 - . Launch Site: Kapustin Yar. Launch Complex: Kapustin Yar V-2. LV Family: V-2. Launch Vehicle: R-1. 1949 September 14 - . Launch Site: Kapustin Yar. Launch Complex: Kapustin Yar V-2. LV Family: V-2. Launch Vehicle: R-1. 1949 September 17 - . Launch Site: Kapustin Yar. Launch Complex: Kapustin Yar V-2. LV Family: V-2. Launch Vehicle: R-1. 1949 September 19 - . Launch Site: Kapustin Yar. Launch Complex: Kapustin Yar V-2. LV Family: V-2. Launch Vehicle: R-1. 1949 September 20 - . Launch Site: Kapustin Yar. Launch Complex: Kapustin Yar V-2. LV Family: V-2. Launch Vehicle: R-1. FAILURE: Failure. 1949 September 23 - . Launch Site: Kapustin Yar. Launch Complex: Kapustin Yar V-2. LV Family: V-2. Launch Vehicle: R-1. FAILURE: Failure. 1949 September 28 - . Launch Site: Kapustin Yar. Launch Complex: Kapustin Yar V-2. LV Family: V-2. Launch Vehicle: R-1. 1949 October 3 - . Launch Site: Kapustin Yar. Launch Complex: Kapustin Yar V-2. LV Family: V-2. Launch Vehicle: R-1. 1949 October 8 - . Launch Site: Kapustin Yar. Launch Complex: Kapustin Yar V-2. LV Family: V-2. Launch Vehicle: R-1. 1949 October 10 - . Launch Site: Kapustin Yar. Launch Complex: Kapustin Yar V-2. LV Family: V-2. Launch Vehicle: R-1. 1949 October 12 - . Launch Site: Kapustin Yar. Launch Complex: Kapustin Yar V-2. LV Family: V-2. Launch Vehicle: R-1. 1949 October 13 - . Launch Site: Kapustin Yar. Launch Complex: Kapustin Yar V-2. LV Family: V-2. Launch Vehicle: R-1. 1949 October 15 - . Launch Site: Kapustin Yar. Launch Complex: Kapustin Yar V-2. LV Family: V-2. Launch Vehicle: R-1. 1949 October 18 - . Launch Site: Kapustin Yar. Launch Complex: Kapustin Yar V-2. LV Family: V-2. Launch Vehicle: R-1. 1949 October 19 - . Launch Site: Kapustin Yar. Launch Complex: Kapustin Yar V-2. LV Family: V-2. Launch Vehicle: R-1. 1949 October 22 - . Launch Site: Kapustin Yar. Launch Complex: Kapustin Yar V-2. LV Family: V-2. Launch Vehicle: R-1. 1949 October 23 - . Launch Site: Kapustin Yar. Launch Complex: Kapustin Yar V-2. LV Family: V-2. Launch Vehicle: R-1. Nation: Russia. Agency: Korolev bureau. Apogee: 100 km (60 mi). Last and 20th launch in second R-1 test series..
1949 December 30 - . LV Family: V-2. Launch Vehicle: R-1. R-1 sounding rocket variants authorised. - . Nation: Russia. Decree 'On work on geophysical variants of the R-1 missile' was issued..
1950 November 25 - . LV Family: V-2. Launch Vehicle: R-1. R-1 accepted for military service. - . Nation: Russia. Council of Soviet Ministers (SM) Decree 'On adoption of the R-1 into armaments' was issued. The missile was accepted for service, with the first operational unit the 92nd brigade (BON RVGK) at Kapustin Yar..
1950 December - . LV Family: V-2. Launch Vehicle: R-1. First R-1 operational unit - . Nation: Russia. The first field R-1 unit was formed - the 23th brigade (BON RUGK). Each brigade was equipped with six launchers. In January 1951 the 23rd deployed to Kamishin in Volgograd oblast. In August 1958 they were transferred to the Land Forces. The number of units fielded were small, reflecting the long delay in getting the R-1 into production. The field equipment was designed to also be used for R-2 missiles, which quickly replaced the R-1 in the field units. 1951 January 29 - . Launch Site: Kapustin Yar. Launch Complex: Kapustin Yar V-2. LV Family: V-2. Launch Vehicle: R-1. Nation: Russia. Agency: Korolev bureau. Apogee: 100 km (60 mi). First launch in winter test series. Carried dogs..
1951 January 30 - . Launch Site: Kapustin Yar. Launch Complex: Kapustin Yar V-2. LV Family: V-2. Launch Vehicle: R-1. Operational test - . Nation: Russia. Agency: Korolev bureau. Apogee: 100 km (60 mi). 1951 January 31 - . Launch Site: Kapustin Yar. Launch Complex: Kapustin Yar V-2. LV Family: V-2. Launch Vehicle: R-1. 1951 February 1 - . Launch Site: Kapustin Yar. Launch Complex: Kapustin Yar V-2. LV Family: V-2. Launch Vehicle: R-1. 1951 February 2 - . Launch Site: Kapustin Yar. Launch Complex: Kapustin Yar V-2. LV Family: V-2. Launch Vehicle: R-1. Nation: Russia. Agency: Korolev bureau. Apogee: 100 km (60 mi). Last launch in winter test series..
1951 May 9 - . LV Family: V-2. Launch Vehicle: R-1. Plant 586 in Dnepropetrovsk to convert to missile production (future NPO Yuzhnoye). - . Nation: Russia. Decree 'On the Transfer of the Dnepropetrovsk Automobile Plant From the Ministry of Automobile and SM Tractor Industry to the Ministry of Armaments--transfer of Dnepropetrovsk Plant No. 586 into the Ministry of Armaments for missile production' was issued. 1951 June 1 - . LV Family: V-2. Launch Vehicle: R-1. R-1 production moved to Dnepropetrovsk - . Nation: Russia. Ministry of Armaments Decree 'On starting of series production of the R-1 at Dnepropetrovsk Plant No. 586' was issued. Factory 66 at Zlatoust was originally selected to produce the R-1 in 1949, with SKB-385 to assume production design responsibility and to develop variations of the R-1 with greater range. But the work dragged on without results, and on 1 June 1951 Beria switched R-1 production to Factory 586 at Dnepropetrovsk. He ordered engine production to begin in two months. 1951 June 13 - . Launch Site: Kapustin Yar. Launch Complex: Kapustin Yar V-2. LV Family: V-2. Launch Vehicle: R-1. Nation: Russia. Agency: Korolev bureau. Apogee: 100 km (60 mi). First launch in quality assurance test series of operational missiles..
1951 June 14 - . Launch Site: Kapustin Yar. Launch Complex: Kapustin Yar V-2. LV Family: V-2. Launch Vehicle: R-1. 1951 June 18 - . Launch Site: Kapustin Yar. Launch Complex: Kapustin Yar V-2. LV Family: V-2. Launch Vehicle: R-1. 1951 June 19 - . Launch Site: Kapustin Yar. Launch Complex: Kapustin Yar V-2. LV Family: V-2. Launch Vehicle: R-1. 1951 June 20 - . Launch Site: Kapustin Yar. Launch Complex: Kapustin Yar V-2. LV Family: V-2. Launch Vehicle: R-1. 1951 June 22 - . Launch Site: Kapustin Yar. Launch Complex: Kapustin Yar V-2. LV Family: V-2. Launch Vehicle: R-1. 1951 June 23 - . Launch Site: Kapustin Yar. Launch Complex: Kapustin Yar V-2. LV Family: V-2. Launch Vehicle: R-1. 1951 June 24 - . Launch Site: Kapustin Yar. Launch Complex: Kapustin Yar V-2. LV Family: V-2. Launch Vehicle: R-1. 1951 June 25 - . Launch Site: Kapustin Yar. Launch Complex: Kapustin Yar V-2. LV Family: V-2. Launch Vehicle: R-1. 1951 June 26 - . Launch Site: Kapustin Yar. Launch Complex: Kapustin Yar V-2. LV Family: V-2. Launch Vehicle: R-1. 1951 June 27 - . Launch Site: Kapustin Yar. Launch Complex: Kapustin Yar V-2. LV Family: V-2. Launch Vehicle: R-1. Nation: Russia. Agency: Korolev bureau. Apogee: 100 km (60 mi). Last launch in quality assurance test series of operational missiles..
1952 June - . LV Family: V-2. Launch Vehicle: R-1. First R-1 delivery from Dnepropetrovsk - . Nation: Russia. First Dnepropetrovsk production R-1, albeit still containing many parts and assemblies fabricated at NII-88, was finally complete..
1952 August 15 - . LV Family: V-2. Launch Vehicle: R-1. First stand tests of production R-1 engines. - . Nation: Russia. First stand tests of production 8D51 engines began on 15 August 1952..
1952 November 28 - . LV Family: V-2. Launch Vehicle: R-1. First production R-1 delivery - . Nation: Russia. The first rocket built completely of Dnepropetrovsk-fabricated parts was rolled out of the factory..
1953 October 1 - . Launch Site: Kapustin Yar. Launch Complex: Kapustin Yar V-2. LV Family: V-2. Launch Vehicle: R-1. 1953 November 1 - . Launch Site: Kapustin Yar. Launch Complex: Kapustin Yar V-2. LV Family: V-2. Launch Vehicle: R-1. 1953 November 15 - . Launch Site: Kapustin Yar. Launch Complex: Kapustin Yar V-2. LV Family: V-2. Launch Vehicle: R-1. 1956 September 13 - . LV Family: V-2. Launch Vehicle: R-1. Russian agrees to sell China two R-1 missiles - . Nation: China. Related Persons: Tsien. Program: Long March. They were delivered in December 1956. Tsien is disgusted to find that the missiles are nothing but copies of the V-2. Something more advanced is needed, he argues to the Russians..
1957 July 8 - . Launch Site: Kapustin Yar. LV Family: V-2. Launch Vehicle: R-1. Nation: Russia. Apogee: 100 km (60 mi). 1957 July 9 - . Launch Site: Kapustin Yar. LV Family: V-2. Launch Vehicle: R-1. 1957 July 10 - . Launch Site: Kapustin Yar. LV Family: V-2. Launch Vehicle: R-1. 1957 July 13 - . Launch Site: Kapustin Yar. LV Family: V-2. Launch Vehicle: R-1. 1957 July 24 - . Launch Site: Kapustin Yar. LV Family: V-2. Launch Vehicle: R-1. 1957 October 6 - . Launch Site: Kapustin Yar. LV Family: V-2. Launch Vehicle: R-1. 1957 October 13 - . Launch Site: Kapustin Yar. LV Family: V-2. Launch Vehicle: R-1. 1957 October 14 - . Launch Site: Kapustin Yar. LV Family: V-2. Launch Vehicle: R-1. 1957 October 24 - . Launch Site: Kapustin Yar. LV Family: V-2. Launch Vehicle: R-1. 1958 January 10 - . Launch Site: Kapustin Yar. LV Family: V-2. Launch Vehicle: R-1. 1958 January 11 - . Launch Site: Kapustin Yar. LV Family: V-2. Launch Vehicle: R-1. 1958 January 31 - . Launch Site: Kapustin Yar. LV Family: V-2. Launch Vehicle: R-1. 1958 February 11 - . Launch Site: Kapustin Yar. LV Family: V-2. Launch Vehicle: R-1. 1958 May 25 - . Launch Site: Kapustin Yar. LV Family: V-2. Launch Vehicle: R-1. 1958 May 27 - . Launch Site: Kapustin Yar. LV Family: V-2. Launch Vehicle: R-1. 1958 July 4 - . Launch Site: Kapustin Yar. LV Family: V-2. Launch Vehicle: R-1. 1958 July 8 - . Launch Site: Kapustin Yar. LV Family: V-2. Launch Vehicle: R-1. 1958 July 15 - . Launch Site: Kapustin Yar. LV Family: V-2. Launch Vehicle: R-1. 1958 July 24 - . Launch Site: Kapustin Yar. LV Family: V-2. Launch Vehicle: R-1. 1958 July 25 - . Launch Site: Kapustin Yar. LV Family: V-2. Launch Vehicle: R-1. 1958 August - . LV Family: V-2. Launch Vehicle: R-1. R-1 retired from front-line service - . Nation: Russia. The number of units fielded were small, reflecting the long delay in getting the R-1 into production. The field equipment was designed to also be used for R-2 missiles, which quickly replaced the R-1 in the field units..
1958 August 16 - . Launch Site: Kapustin Yar. LV Family: V-2. Launch Vehicle: R-1. 1958 September 8 - . Launch Site: Kapustin Yar. LV Family: V-2. Launch Vehicle: R-1. 1959 January 29 - . Launch Site: Kapustin Yar. LV Family: V-2. Launch Vehicle: R-1. Nation: Russia. Agency: RVSN. Apogee: 100 km (60 mi). 1959 June 20 - . Launch Site: Kapustin Yar. LV Family: V-2. Launch Vehicle: R-1. 1959 August 17 - . Launch Site: Kapustin Yar. LV Family: V-2. Launch Vehicle: R-1. 1959 November 9 - . Launch Site: Kapustin Yar. LV Family: V-2. Launch Vehicle: R-1.